The traditional prophecy, attributed to St. Columbia, that “a stranger mounted on a white horse and bearing a shield of painted birds shall conquer Ulster” appeared to be fulfilled when John de Courcy headed the Norman invasion of Ulster in 1177. Gradually the Anglo-Norman overlords established their strongholds along the coastal strip of Ulster, preferring to have outlet to the sea, in case of siege. Their hub of power, Carrickfergus Castle, built between 1180 and 1205, dominated Belfast lough, the natural point of entry to Ulster. The castle continued for centuries to be the military focus of the north, and wave after wave of native resistance broke against its walls. When in 1210 King John paid a punitive visit to his unruly Anglo-Irish lords in Ulster, it was here he came; the room in which he stayed may still be visited. 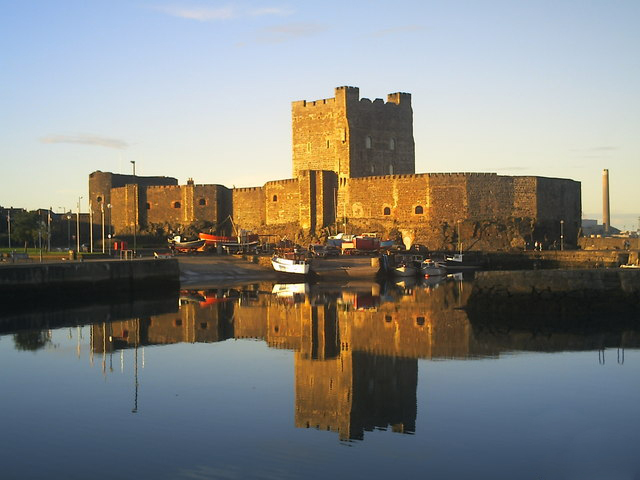 When Edward Bruce assisted by his brother, King Robert of Scotland, invaded Ireland in 1315, Carrickfergus Castle fell to him after strong resistance, but it reverted to the English after his defeat and death in 1317. In 1688 it was held for James II by Lord Iveagh but was captured the following year by Schomberg. A tablet on the pier below the castle marks the spot where William of Orange first set foot in Ireland in 1690. It is only a few years ago that the castle, for the first time in its history, ceased to house a military garrison. Its most notable feature is the massive square keep, five stories high and with a wall 9ft thick. Carrickfergus Castle is a must see attraction on your tours of Ireland, contact us now to organise your visit!